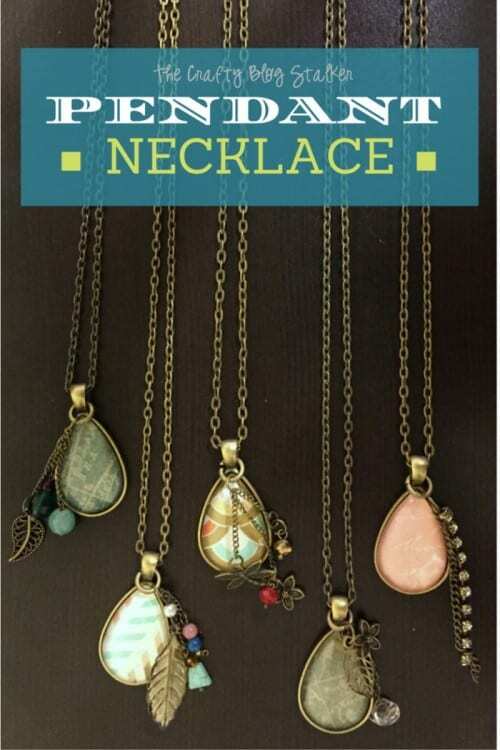 Design and create a beautiful Pendant Necklace. 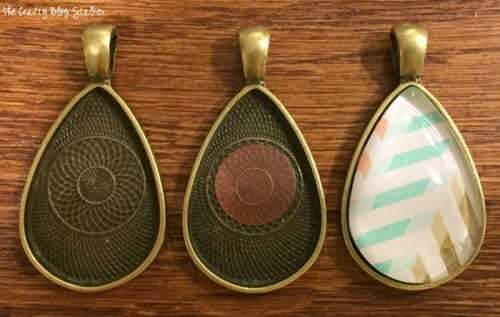 DIY Jewelry makes a great gift or simply a way to show off your own style. An easy craft tutorial idea. 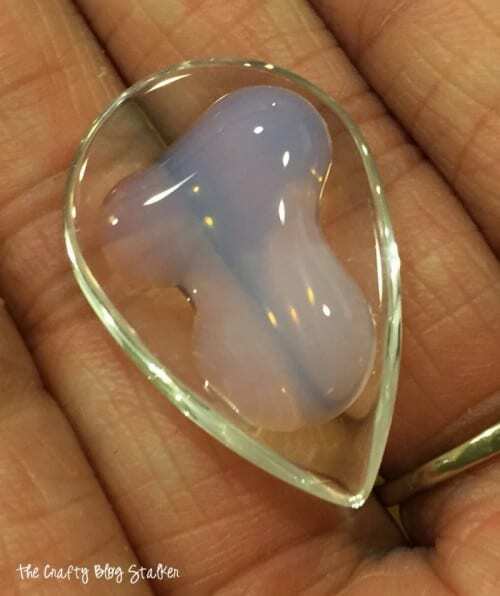 I was recently at a craft expo and found this totally awesome booth that was all about making pendant jewelry. I quickly fell in love with everything they had to offer and knew that I HAD to make a couple pendant necklaces. I also couldn’t help but think what great gifts these would be, and that is exactly what they turned into. The booth I purchased from was called Craft Fantastic. Don’t worry, they have a website too. www.craftfantastic.com I want to point out that this is not a sponsored post. I am promoting because I fell in love with their jewelry. The kit I purchased came with everything I needed to make 16 square pendant necklaces and full-color instructions. 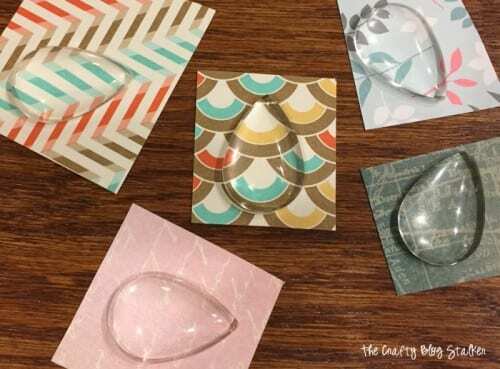 I also loved this dew drop shape so I bought this additional kit and used the supplies from the other kit to make them. It has enough additional supplies to makes more than the 16 original, so I don’t have to worry about running out when I go to use the original kit. Craft Fantastic has images sheets that you can use, but I chose to use some Scrapbook paper scraps that I had on hand. To start, I laid out the glass pieces over my scraps of paper to find what I wanted to show through the glass. Apply a big dollop of Fantastic Glaza and Glue on the back of the glass piece. You want the glue to ooze out along the edges so you get a good seal. Then just wipe the excess away with a q-tip. 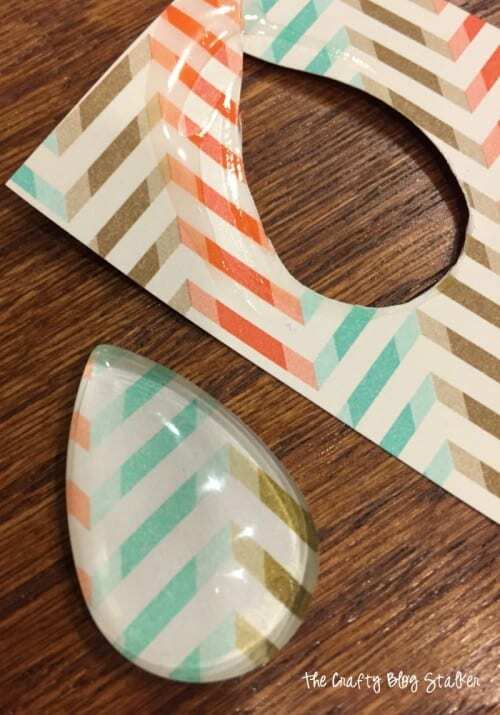 After the glue is nice and dry, cut it out along the glass edges using a pair of scissors. The kit comes with double-sided adhesive dots. Apply one to the center of the metal pendant tray, remove the backing and then insert the glass piece. Push the two together nice and tight for just a second. The adhesive dot holds the glass piece in place very well. Here are my 5 pendants all complete. The original kit came with the chains, so all that is left is to add a few other jewelry charms that I purchased and created, add the chain and they are done. I absolutely love the finished pendant necklaces that I created. I kept the pink one on the left for myself and gave the other four away as gifts to some blogger friends of mine. Since they were a gift, I needed a fun little jewelry card to put them in. 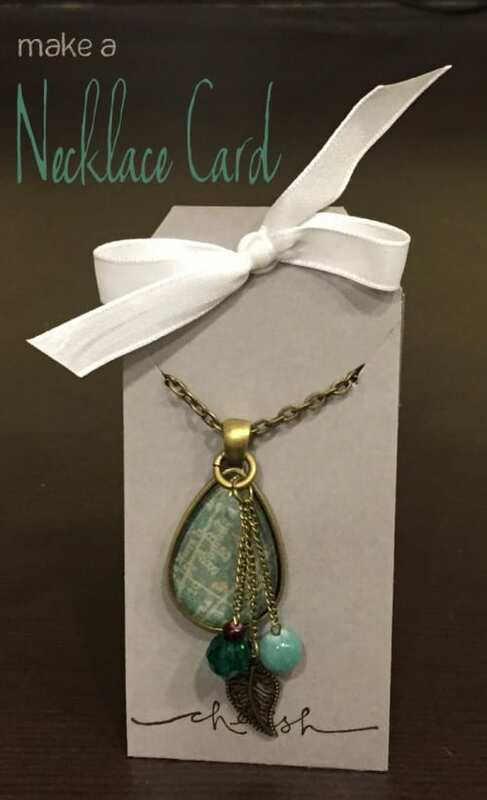 In another post, I shared how to make a Necklace Card tutorial. Now you can make everything including the packaging! You should check it out. Who would you make a Pendant Necklace for? Share and leave a comment below! 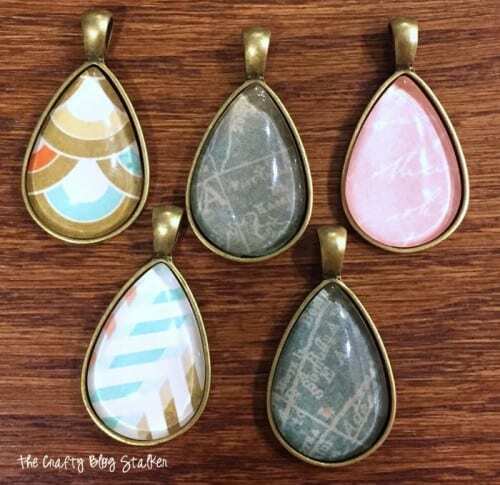 SAVE HOW TO MAKE A JEWELRY PENDANT NECKLACE TO YOUR FAVORITE DIY JEWELRY PINTEREST BOARD! You are talented. I am a DIY jewellery maker. They are amazing. Many thanks for sharing this. 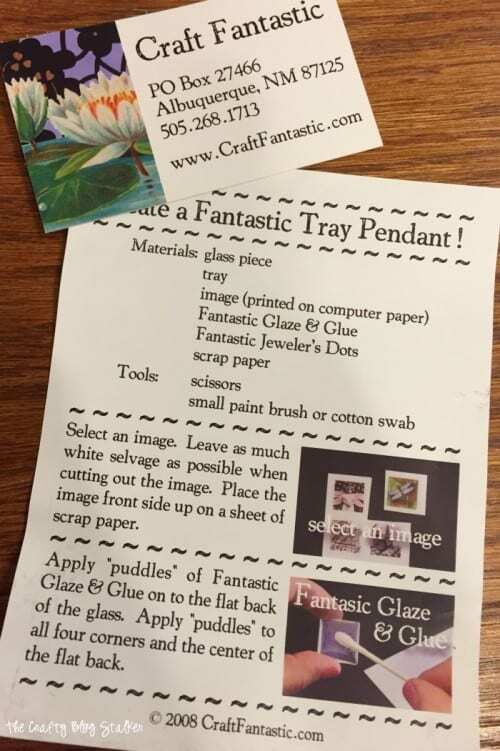 I am really excited and interested to know how you make necklace card. Can’t wait. These are awesome. My teen has been wearing a lot of necklaces lately and it’ll be nice for her to make her own. Very cool idea! I love accessories that can be personalized. Thanks for sharing—this is getting pinned! These are really really nice and would make wonderful gifts too! Thank you so much for sharing with us the Brag About It link party!! I love these necklaces Katie! Thank you so much for my roommate gift. My necklace is so pretty! These are charming! What a great jewelry DIY project! these are super awesome, Katie!! Thanks for sharing! Super stylish! I’ll have to look into getting a set. Great gifts! Seriously love these – I’m guessing you could use fabric too – I love the charms you added, particularly the pink one! Sarah – I love the idea of using fabric! That is super smart. I am totally going to have to give that a try! I really like these! I think I will make one for my mom for Mother’s Day. Just add some charms that have meaning for her and done! Thanks! They really are that easy! Thanks Pam! 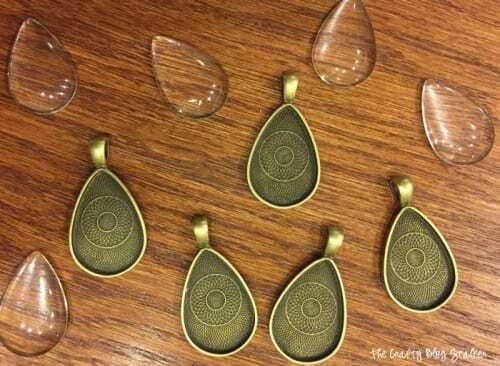 These pendants look amazing! I would love to try and make some! You are so welcome Silvia, I am so glad that you like it. 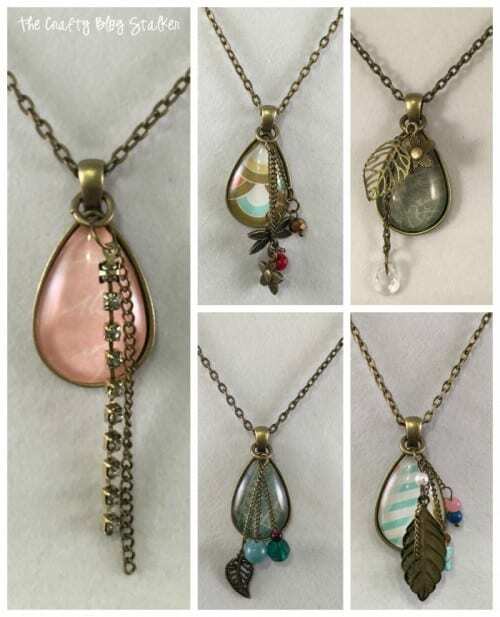 I’m glad to see that pendant necklaces have become popular again….and some are very long…hanging almost to the waist!…very pretty! I have seen the super long ones too! Thanks for stopping by Suzy! Such beautiful designs I’m not sure which is my favourite. Thanks for sharing with us at Over the Moon link up. Thank you Sue! I am so glad that you like them. They were a lot fo fun to make. These are SUPER CUTE!!! You did a GREAT JOB! May I ask where you got your beads, charms, & small link chains to hang charms off of please? Thanks, Natalie! I am so glad that you like the necklace! The charms I purchased at Hobby Lobby, a local craft store.